"We strive to make sure that all kids have the opportunity to attend college after graduation or have the skills to go directly into the workforce," says Farrell, 2018 California Teacher of the Year. When Kirsten Farrell G ’98 left UVM with a master’s degree in school counseling and skills as an athletic trainer she wasn’t quite sure how she would utilize the rare combination. 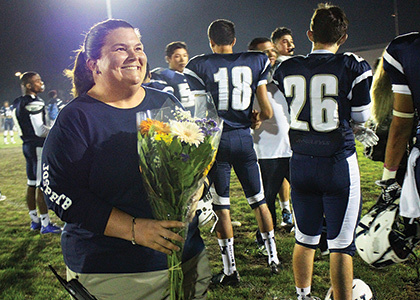 Two years later, as a teacher and athletic trainer at Venice High School, she found an innovative way to leverage both. Across the years, her work would change the lives of students, recently earning her recognition as a 2018 California Teacher of the Year. Farrell, a health science and medical technology teacher, started the first on-campus sports medicine program in California focused on training students how to perform the duties of an athletic trainer. The idea to start the L.A. Unified Sports Medicine Team came to Farrell after three students asked if they could shadow her while she worked as an athletic trainer at Venice High football games. Because the students enjoyed the experience so much, Farrell eventually started incorporating aspects of athletic training like CPR and First Aid certification, taping and stretching techniques and rehabilitative exercises into her sports medicine course curriculum. It wasn’t long before she had to cap the program at 40 students, who gain hands-on experience while providing sideline game coverage and rehabilitation services for more than 400 athletes on 23 athletic teams. The result, some 13 years later, has been an increase in the number of students at Venice High – many of whom live in poverty – who enter the medical field after graduation as emergency medical technicians, for example, or go to college to become athletic trainers, physical therapists, nurses or doctors. Farrell says she was surprised to have been named a finalist by the California Department of Education in her own Los Angeles Unified School District – the second largest district in the United States – much less being honored as one of five finalists in a state where 300,000 teachers educate approximately six million students. A self-described “Air Force brat,” Farrell moved often as a child, eventually landing in Rhode Island where her father was stationed at Naval War College in Newport. After earning a bachelor’s degree in education at Plymouth State, she taught elementary school in Tokyo, where she became interested in school counseling and athletic training while coaching at a middle school. Farrell moved back to the United States to find a college that would let her major in school counseling and become an athletic trainer. UVM accepted her as a full-time graduate student in the counseling program and also agreed to let her work toward her athletic training certification as a non-traditional student. Following graduation, she taught briefly at a boarding school in Switzerland before moving to California to take a job as an athletic trainer for West Coast Sports Medicine Foundation, which included rehabbing and training professional athletes from the National Football League and National Hockey League. Now that the Venice High School Sports Medicine Team has been in place for 13 years, Farrell is hearing from former students working as EMTs, massage therapists, nurses, doctors and athletic trainers. “We visit graduates working in the field so students can see someone from their high school working at a Division I program like UCLA that they hold up on a pedestal,” says Farrell.